Download Simple Business Card Template PSD. This is a clean and Simple Business Card template which can be used for design, photographer, freelancers or even for design studios and all type of Graphic Industry. This Free Business Card Template is Very easy to customise and you can change text, color, edit font and add or remove elements quickly using adobe photoshop. You can easily replace Image and icons used in this business card template according to your requirement. 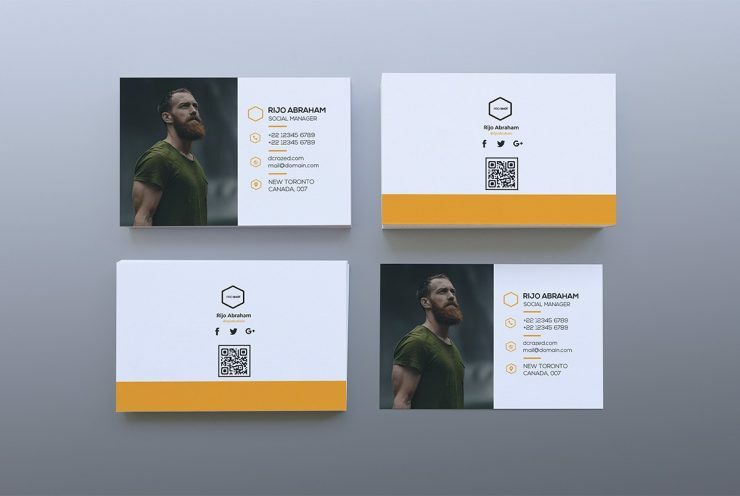 This Simple Business Card Template PSD has a smart object which makes you work easy and you can add image And edit file with Smart-Objects in just few clicks. This free business card template contains 2 x 3.5 in, 300 dpi print-ready CMYK 2 PSD files (Front and Back side design). Hope you like this Simple Business Card Template PSD. Enjoy!